Metrosideros excelsa, New Zealand Christmas Tree, an evergreen, native to the islands of the Pacific, from the Phillipines to New Zealand. 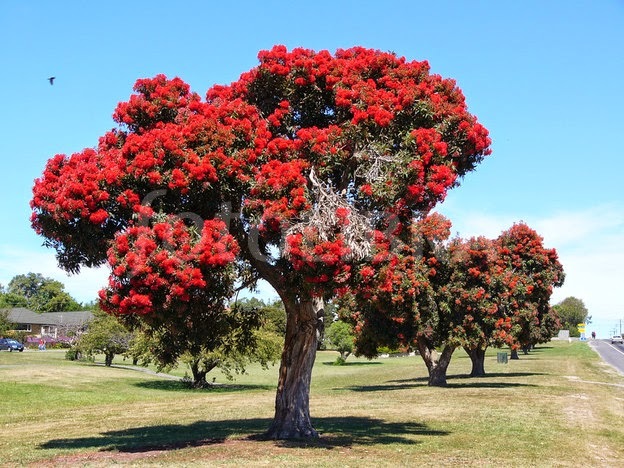 The Maori name ´Pohutukawa´ means ‘spray sprinkled’. Grown as ornamental shrubs and trees for their showy crimson flowers with many long prominent, crimson stamens. The flowers are pollinated by bees. Excelsa means ‘tall or high’. The plentiful edible viscous green nectar was collected by the Maori for food. It is also enjoyed by bees to make a sweet pale honey which (a measure of its quality) has been one of New Zealand’s exports. In its native country the tree will grow so close to the shoreline that its branches hang into the salt water. In those circumstances according to some authorities oysters have even been harvested from them. It is said to have been Sir Joseph Banks (1744-1820) the famous English botanist, and the Swede Daniel Carlsson Solander (1736-1782) who discovered the New Zealand Christmas tree in 1769. They had accompanied Captain James Cook (1728-1779) on HMS Endeavour on his 1768-1771 expedition. This hard durable wood has been used for boat building and for making bearings. It has also been used for making idols. The trees are cultivated for their ornamental attributes and as hedging.